How are small businesses currently using social media and how can a small business benefit from a social media strategy? In a small business survey conducted by Clutch, results showed that 53 percent of small businesses actively use social media. 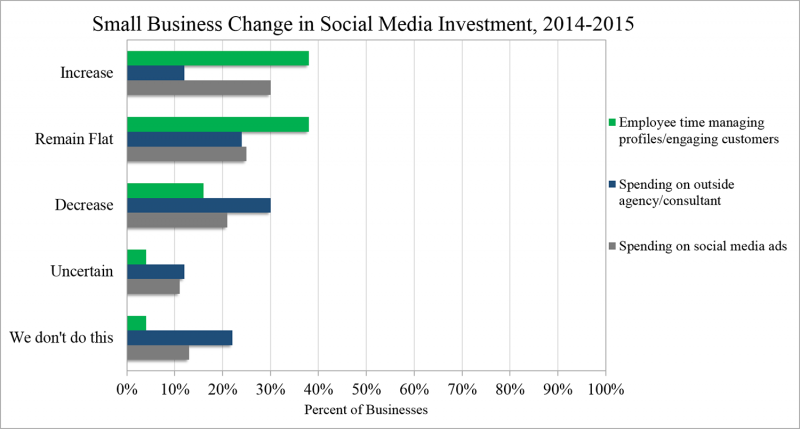 We investigated small business investment in social media and the change from 2014 to 2015 further, focusing on investment in employee time, spend on an outside agency or consultant, and spend on social media ads. We interviewed social media and digital marketing experts for their thoughts on the survey results and for insights on how small businesses can develop a comprehensive social media strategy. Below the infographic there is more detail on the survey data along with additional analysis from the experts we interviewed. In our survey, we found that some small businesses do not have a robust online presence. Almost half of small businesses said that they will allocate 20 percent or less of their marketing budget to digital marketing in 2015. Small businesses that have not adopted digital marketing techniques can gain from learning about the benefits of a wide-ranging digital strategy. Our survey shows that there are opportunities for small businesses to improve their digital marketing strategy as 53 percent of businesses actively work on social media, 45 percent work on search engine optimization, and only 25 percent work on online advertising. A social media presence is an important part of any digital marketing strategy. Social media is a tool for small businesses to reach potential clients and interact with current clients in a community-type way. Social media offers a way for small businesses to be personable and provide unique information about their companies on a platform that consumers trust. Individuals and businesses increasingly look to social media for news and updates from their social community; therefore, it is a far-reaching community to expand business opportunities and connections. Mike Rosa, the director of marketing at 180Fusion explains how social media is an integral part of the way consumers interact and look for valuable information these days. "More and more, we're becoming a little bit wary of traditional advertising. We're being conditioned to push it to the side and ignore it, the same way you would ignore anyone who is only saying the best things about themselves. We're much more likely to take referrals and reviews from people that we know and trust. That's where we turn to social media, to find out who else has had a great experience with buying that service or product. If small businesses want to compete, if they want to level the playing field with their competitors, if they don't want to lose ground, they have to be participating in social media. The way that people buy things is changing. There's no way around that, there's no way to circumvent the change in behavior." The way that customers are buying things is continually changing. More than ever, reviews on products and services can be found online so that the consumer can make a relatively educated buy. Moreover, the younger generations turn to social media for advice and trustworthy suggestions from their social community. Josh Dirks, chief executive officer and co-founder of Project Bionic, illuminates the change of buying power and the importance of small business participation in social media for the future. "Today, 50 percent of the world's population is less than age 30. This generation is more connected and tech savvy than any generation. The way they consume information is also a great departure from past generations, they want what they want, when they want it, and how they want it. If your brand doesn't provide this experience, then they will mark you off the list and find a competitor who does provide this instant connection. But, most brands have discounted this, saying social media is only for kids. I've got bad news for these brands. They aren't kids anymore, they have the largest buying power of any generation in history, and your brand just missed out because you didn't want to be part of the social era. Small businesses and brands need to accept this new way of reaching customers, invest in being timely, and value the customer experience." Social media platforms provide a source of general information and news about a company, a way for businesses to interact with customers and other businesses as well as a way for businesses to improve organic search results. In our survey, we asked small businesses if their company uses social media, this includes actively maintaining profiles and engaging customers on social platforms. These platforms can include Twitter, Facebook, LinkedIn, Pinterest, Instagram, Google+, and YouTube, among others. Survey results showed that 53 percent of small businesses actively use social media. 25 percent of small businesses stated they are unlikely to use social media in the future. Garry Kanfer, vice president of Big Drop Inc., explains the relevance of social media for every small business. "I feel that, in today's industry, 25 percent of businesses that are unlikely to use social media is a very big number. When consumers look at your business, most of the consumers want to see who you are. So, in order for them to see who you are and what you're about, your website is good, but they also want to look through your social media's pages, and they want to look through review pages. Social media pages explain who you are, help you connect with consumers, and help you to gain repeat business." — Garry Kanfer, Big Drop Inc.
John Jantsch, the founder of Duct Tape Marketing and the author of the book "Duct Tape Marketing," explains how social media and digital marketing strategies are practical for small businesses. "Social media, in the last couple years, has gone straight up in terms of usage. I think it's indicative of the fact that there is a sense that it has not only become mainstream and expected, but that it's free. I think in some ways it's the great equalizer. Digital marketing has made it so that a tiny company can effectively get their message out in some places in a very nimble, flexible way. They can try a lot of things, they can track a lot of things, and hone in on a couple things that work, that may or may not cost that much money, that allow them to really compete. Because of the way people buy today, small businesses with thorough social media strategies are able to compete with much larger organizations." Social media can uniquely benefit every small business, providing a way to develop social relationships that help build a business brand and reputation. Small businesses can create profiles that allow them to associate with more customers and businesses than ever before. 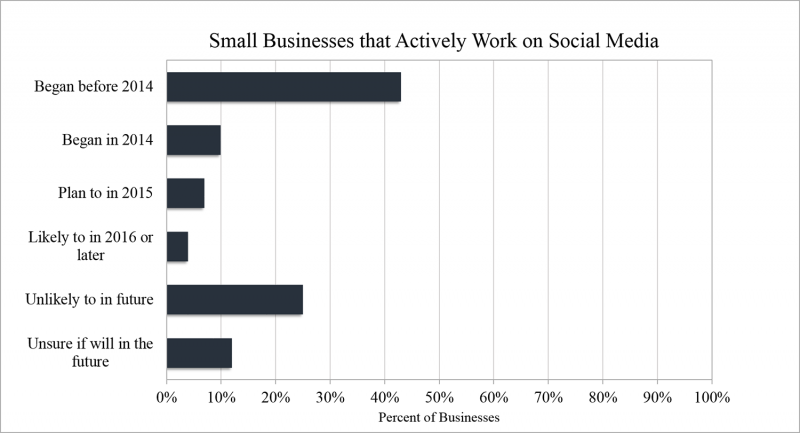 So, why are 47 percent of small businesses still not investing in social media? Some of the small businesses that have not adopted a social strategy might think that social media is not relevant to their business sector. However, education on the benefits of social media can show these small businesses how advantageous a strategy can be. Anthony Gaenzle, the director of marketing at EnVeritas Group, identifies some industry specific resistance to social media that he has encountered. "What I've seen is that you'll definitely have fluctuations with different industries. Manufacturing for example, they're a little bit more skeptical, sometimes, when it comes to something like social media. The C-level teams in manufacturing institutions sometimes are a tough sell, I guess you would say, and they push back a little more. I think education is the key thing, putting out pieces like this, and case studies from different industries. I think that, if we all do our job and start educating companies, they'll understand the value of social media, and start to use it a lot more effectively." Dissimilar industries can benefit from different social platforms. Every social media network is not ideal for every business and, depending on business goals for social media engagement, the appropriate platforms will vary. The small businesses that do not see the value of being on social media can benefit from learning about the long-term gains, including brand awareness and reputation management. Ken Braun, the founder and chief creative officer of Lounge Lizard, explains how the purpose of social media has been lost among some small businesses. "For the small business person, we personally have seen a decline in social media spending and here is why. The smaller business owner wants to see a return on investment very quickly. We've had several small businesses that have come to us to handle their social media as far as their Facebook, Twitter, Google+, LinkedIn, Pinterest, and Instagram. They like to see the activity and all the social media promotions that we're coming up with, but they want their phone to ring every day. They want the immediate results from social media. The problem with social media is, it's not short-term; it's really more of a long-term brand awareness strategy. My experience is that the small business owner doesn't really understand this with social media because they want the immediate sales right away, and that doesn't happen." Even though social media success is not immediately rendered, long-term investment in social media can payoff. "The thing about social media is that it doesn't usually get the final event that generates a sale or conversion. It usually is the top of the funnel event that warms people up, to introduce them to your business. Then, as we follow up with them through email, through remarketing, and through other channels, it ends up being those other channels that get the last point of attribution, and end up getting credited with revenue when it really was social media that got the ball rolling. I think those that are not engaging at this point in social media or not planning to are missing out on a very fundamental shift in the way consumers buy things." Participation in and interactions on social networks not only help businesses connect with their audience, but increased activity and sharing can also effect search rankings. Search engines can connect a company's activities across different social networks, and these social signals can influence the authority of a company website, increasing visibility, brand recognition, and website traffic. "One significant factor is the effect that social signals have on SEO. It's interesting to see, in so many ways, these channels and segments of different digital strategies overlap. For example, on Facebook, if you post an organic post, you can go ahead and put some paid ad spend behind it. So, their social overlaps with social ads. If you get great responses to content you put out on social media, it signals to Google and other search engines that your content is valuable. Really, at this point, a well-rounded, comprehensive strategy across all these channels is really what's needed to succeed, to stay relevant in your industry." Small businesses do not need to participate on every platform, but rather they should identify the platforms that best complement their business style. It is more advantageous for a small business to start by participating on one or two platforms where the majority of their audience resides. Anthony Gaenzle explains that small businesses need not be overwhelmed by the potential platforms that they could be on but, rather, should identify where their audience mainly participates and start on that platform. "I think one of the things companies feel is that, if they're going to do social media they have to be on every platform. They have to be on Facebook, Instagram, Twitter, Pinterest, Snapchat, LinkedIn, and everything out there. However, what they really need to do is get started with their available resources, on the main channels where the majority of the audience is, and then go from there. Talk to their customers and find out where they are, what social media channels they're using, and then just use one or two of those to start. If most of your customers are on Facebook, start on Facebook. You can easily manage that, versus trying to manage six, seven, or eight channels. It's much more difficult, and I think that's where those companies tend to shy away." All small businesses can benefit from participating in the social networks that their customers reside in. To be successful on these social platforms, small businesses must start by developing a diligent social media strategy. John Jantsch explains how too many businesses do not focus on their social media strategy. "I think that more than anything else, I still see very few people taking a strategic approach to social media. There is still a real pervasive sense that we just need to spend more time, and to be doing more on networks and whatnot, without building it into their overall strategy. I think that small businesses can definitely benefit from putting the time into developing a comprehensive social media strategy." So, how can a small business develop a constructive social media strategy? To begin, they must determine the best way for their business to invest in social media. How are small businesses currently investing in social media and what are some ways to improve investment? Initially, social media is a free platform for companies to make profiles and to participate in the platform's community. Actively updating profiles and engaging customers on each platform does take either employee time, the hiring of an outside agency, or a mix of both. Additionally, there are types of paid advertisements and promotions that can influence a business's visibility on a certain social media platform. These are all different ways that a small business can invest in social media. We surveyed the small businesses that actively work on social media on how they expect their investment in social media to change from 2014-2015. We considered three forms of investment, employee time updating profiles and engaging customers, spend on an outside agency or consultant, and spend on social media advertising. Employee time seems to be the most used social media resource, with only 4 percent of respondents saying that they do not do this. Conversely, 13 percent say that they do not use social media ads, and 22 percent said that they do not use an outside agency or consultant. Employee time is expected to increase the most in 2015, with 38 percent of small businesses expecting an increase, 30 percent expect an increase on social media ads, and only 12 percent expect a spending increase on an outside agency or consultant. The businesses that use an outside agency or consultant report the highest percentage of an expected decrease in spending at 30 percent. Overall, our survey shows that investment in employee time is the most utilized approach for social media, while spending on social media ads seems to be increasing for 2015. On the other hand, spending on an outside agency or consultant seems to be the least utilized approach with the largest percentage of small businesses decreasing spending in 2015. What is the right mix of investment in social media? Every social media strategy depends on the type of business, and the right mix of all three social tactics can immensely benefit a small business social strategy. There are advantages to investing in social media in each way. 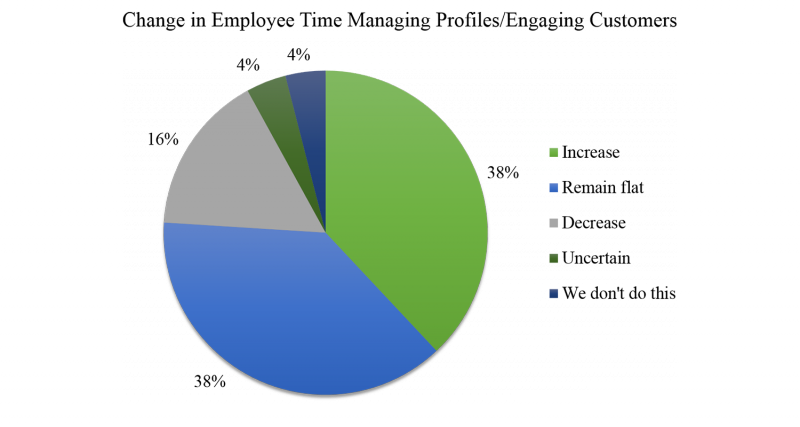 Employee time invested in social media is the most utilized strategy for small businesses that we surveyed. Employee time running a social media strategy can be beneficial, but a business must also figure out what the suitable amount of employee social media control is. Using existing employees to manage the social platforms can seem relatively cost effective. Employees are most connected to their business, they have passion for their company, and they know about daily news and updates within their business, making them a sincere voice for any social platform. "Typically, nobody is more passionate or knowledgeable about an organization than their top level management or executives. So, having some buy in, someone to participate, be able to guide brand messaging, and provide that extra level of detail and insight into the day-to-day workings of the company, that's what helps the conversation really become personal instead of just interesting alone. I think having an agency work together with the small business employees, is an ideal situation." Employees can offer a lot of company personality and firsthand experience on a social platform. However, employees must be educated on how to effectively use social media for their business. Employees that are not vetted on how to publish on social media platforms properly, can fail to target the majority of their intended audience. "If a small business tries to do social media on their own, the tendency is to view everything through their own lens and be overly self-promotional, to talk only about their business, only about their promotions, and only about their events. Social media really is, in many ways, like a conversation. If you're in a conversation with someone and all they're doing is talking about themselves, you very quickly tune out of that sort of content because you're not involved. We try to coach our small business owners on the fact that, as much as they would like the conversation to be all about them, they need to be good conversationalists and make it about their audience as well." Relying on employee time to update profiles and engage customers can also take time away from an employee's primary responsibilities in a small business. However, simply hiring new employees to work on social media can be unnecessarily costly. So, instead of hiring new bodies or spending too much employee time on social media, a reliable social media consultant or agency can come in and help create a strategy that works alongside current employee time. Josh Dirks discusses the importance of having dedicated employees alongside a helpful agency to educate employees on the best ways to be successful and utilize time efficiently. "I think some small businesses are looking at how to hire more bodies, while that's a great idea, I don't think small businesses have the budgets to build real robust, internal teams. So, small businesses should be looking not just for employees that can help them with strategy, they need to find ways to help the actual execution of the content generation game. Without that, you're not going to ever see results from social media. Money needs to go towards content creation and/or towards finding an agency that can truly help the small business owners with this instead of towards building a large marketing team internally." In our survey, 22 percent of small businesses do not use an agency or consultant for social media and, of the small businesses that do use one, 30 percent plan to decrease spend in 2015. Experts point to the importance of using both employee time and an outside agency or consultant to aid a small business social media strategy. An outside agency or consultant can help determine which platforms are best for a certain company as well as how to connect with the right audience on those platforms. Additionally, an outside agency or consultant often knows the trends for social media and can help create content pieces and relevant posts that can entice the right audience. Mike Rosa discusses the advantages of having an agency on board while also having employee support and engagement. "If you're a small- to medium-sized business and have limited resources, having an agency involved is very important. Ideally, the best outcomes that we see are in situations where we have a very blended approach to social media. In our experience, whether we're working with an owner or a person designated to social media on their side of the fence, having our team in place to provide a lot of strategy and generate content, and then have a business owner or someone engaged on their end as well, that creates a really good synergistic situation." A mix of employee participation and agency guidance can be more reliable than either strategy on its own. If an outside agency has complete control over a business's social media, the social profiles can lose a little bit of the authenticity. The cost of an outside agency can be expensive, especially for a small business; however, investing sufficient employee time that is not efficient can also be unproductive. A mix of agency consulting and employee dedication can be valuable and cost effective. Anthony Gaenzle talks about how an agency coaching a business on social media tactics can be a constructive strategy. "I think a lot of companies are looking to bring the management inside their own teams. However, we also see them bring in an agency like EnVeritas Group to do a lot of creation posts and management of the full spectrum. One thing we see a lot of is companies starting with smaller engagements with an agency to serve as an outline for what to do and then receiving training and having the agency serve as coaches as the company's team learns to manage the social media themselves. A lot of times, what we'll do is come in and conduct an audit, develop a strategy, and then we'll coach their team. So, I think there's a mix of employee time managing and bringing in agencies from outside." Small businesses can use an agency to educate their employees and to help develop their social media strategy. Finding the agency that is right for a distinct type of business is crucial, Josh Dirks explains how the right agency can make a measurable difference in both effectiveness and budget. "I think finding the right agency partner, finding an agency that's not going to charge insane rates, can really help a small business be successful. At Project Bionic, we offer a service that allows a small business owner to have a five or six person team working on their social media efforts, for the cost of one to two employees. So it's a much discounted rate over that, and we actually do the execution of the content, we're doing all the reporting. Going out and finding shops that truly align themselves with the business owner, instead of going to a company that only does it halfway like a former PR agency, or former search agency. I think it's finding the people that are the true executioners in this space and partnering with them." Social media advertising, alongside employee engagement and agency guidance, can be an essential addition to a social media strategy. Some small businesses seem to see the advantages of social media advertising as 30 percent plan to increase spend in 2015. Once a business builds a presence on social platforms, social media ads can help to further reach current and potential clients. A social media advertising strategy can vary depending on the platform that a specific audience resides on and the targeting abilities of different platforms. "We really like to see a very blended approach, organic social media, agency working directly with somebody on the inside of the organization that's bought in, and then typically boosting that with some measure of social ad spending. We found specifically on the social ad spend side of things that, contrary to some beliefs that are held, you can directly generate conversions through social media advertising. It doesn't have to necessarily just be about branding and sharing a philosophy or a message. You can generate direct response, whether that's directly generate leads or sales, absolutely can do it through social media advertising if it's done the right way." There are various reasons that social ads can be constructive for a small business. One being that spend on social advertising can be more cost effective for small businesses. If their audience can be reached successfully on social media, then spending on social ads is often more reasonable than the cost of online advertising through Google AdWords. Anthony Gaenzle discusses the lower entrance hurdles for social ads. "I don't think, for small businesses, you have to spend a lot on ads. I think it's a great way to increase following, and I think it's a great way to engage with your followers with important posts, but I think companies shy away from it because they think it's expensive. That’s not exactly true. You can pay $100 a month or even just $50 a month, to create an ad that's highly targeted on some sites like Facebook, Twitter, which has ads now, and LinkedIn. You can be really effective with just a little bit of money. Larger companies obviously can be more effective because of larger pockets, but I think companies do benefit from social media ads once they build up their presence." In conjunction with the ability to spend a sensible amount on social ads and get a reasonable return, social ads have become more imperative with recent social network algorithm changes. Some social platforms are making it so businesses get less visibility than community members, thus, advertising is more persuasive on these sites. "Facebook's famous algorithm now, that even if you built a large following on a Facebook business page, you now have to buy advertising if you actually want those people to see anything." Most social media networks have enhanced filters to target desired audiences through advertising. Audiences can be targeted based on location, industry focus, general interests, gender, and even more. People are willing to give more personal information on social profiles, allowing for additional qualities to be distinguished and targeted by businesses. "As a consumer, it's almost scary the amount of information Facebook knows about us and will let us use to target ads. As a marketer or as a business, it's a tremendous opportunity to be able to target people by what they like. Facebook buys data from a number of different third party data providers. So being able to target people by approximate net worth, value of their home, whether they're credit card users, whether they're above average spenders, what categories of goods they spend, whether they're online or offline buyers. These sorts of targeting mechanisms are so valuable when utilized the right way." Social media is based on a community and people in these different networks inherently trust what is going on within their social community. If a business can build trust with their followers, they are more capable of relying worthy information, and social media ads have the potential of being more valuable. "We're huge advocates of paid social spend. We get fantastic results, especially through retargeting of social networks. If somebody's come to your website, and for whatever reason they haven't gone ahead and contracted with you for goods or services, what better way to keep them warm to the idea of doing business with you than to follow them around on their social media networks? There's an inherit amount of trust that comes with advertising on that platform. Users tend to trust it more than they would a typical banner ad on some random website. What better place to be than in Facebook's newsfeed, in between pictures of what their friends and family members are doing and posting on social media." Overall, it is difficult to separate each of these investments in social media when, realistically, they all overlap and can be valuable to an ample strategy. After inquiring on the ways small businesses can invest in social media, we asked experts how a small business can measure their success on social media. When investing employee time, spend on an agency and spend on social ads, how can a business be sure that there is a worthy return on investment? "I think that really depends on the company, their objectives and their goals. For example, if you have a retail website, you can measure it by conversions. If you want to send visitors from your Facebook page to a specific sale, and you want to measure it that way, that's great. Another goal might be to increase brand recognition, you can look at traffic on page, traffic you're sending to your website in general. I think it really depends on the company and on where they are as a company. Are they just starting, are they more established, are they looking to seek brand recognition, are they looking to increase sales? There are so many things that you can accomplish using social media that I think it really comes down to what that specific company wants to accomplish by using it, and that is largely what success will be measured by." Success on social media can vary depending on the business social media goals. Was the goal to increase brand awareness, to drive more traffic to their site, to gain leads and conversions of sales or some other variation? Success can be measured by analyzing individual social platform analytics or by measuring Google Analytics engagements alongside different social interactions. "There are a lot of conversion pixels now, which you can get from the different social media sites. I think finding ROI in social media is all about getting very strategic, and looking at all the results. I think that you need to track the front end of the content, looking for the engagement with the content, judging what kind of engagement, are you getting likes, comments or better yet share is vital. Then, making sure that you're using the conversion pixels, whether that's from one of the third-party ad analytic servers, or from Facebook, or Twitter, or something like that. If you're putting those on your conversion pages, you can really start seeing the impact you're having. What we know is that, over a period of time, your social sales start to come in and supplant your search sales. If a customer already knows your name and what you do from their Facebook feed, they don’t need to do a search that also might lead to your competitor, you have essentially boxed out your competition. It also takes six to nine months – it's not instantaneous. It takes a little bit of time, but with that investment over time, you have a built in audience who will continue to buy your products, and the good news is you don't have to re-buy that repeat customer each time." The community aspect of social media is a consistent evaluation of success. Social media is all about connecting with followers and creating a trustworthy community to refer to for updates and information. Continually facilitating this trustworthy relationship that followers want to interact with and follow through with is a measure of success on social media. "I think the ultimate metric for pretty much any of this is whether it is leading to building a community that can ultimately be guided into being customers and repeat customers and referral sources. To me, you should be using social media to drive people to content on your property, where you can capture them as a potential lead, continue to educate them, and invite them to go deeper. Ultimately, measuring each of those goals and those steps along what people talk about as a funnel, I think the tools are there now to do that kind of measurement, that kind of automation and tracking." Social media is a decisive tool for small business success now and in the future. Social media is not only a tool to try and increase direct conversions, it is also a way for a business to become a part of a specific community that their customers participate in. The engagement and relationships made through social media can create reliable customers and business relations that make for long-term brand advocates. Overall, our survey shows that many small businesses have not recognized the opportunities that social networks provide for businesses. "It's a little disheartening that there's still a lot of small businesses that are not taking advantage of some of these incredible tools to be more efficient, and do things more cost effectively, and to ultimately be more profitable. I think that's probably the lesson I've learned during the last 10 years. You use some of these tools effectively and, all of a sudden, you're not selling anymore, and you're not convincing people whether or not they should buy from you. You become the option of choice by building a brand, and building authority, and being seen as an expert. I think that's available to anybody, regardless of where they're starting and regardless of the size of their business." In the end, social media is a tool that can be used to connect a business with the way consumers and other businesses are interacting on the Web. There are different ways for a business to invest in social media and to create an adequate strategy. Ultimately, some overlap and combination of employee investment, agency or consultant guidance, along with some form of social advertising can lead to different values of success for a small business. Social media can be highly valuable and a comprehensive strategy can help drive long-term small business success. Clutch collected this survey data from 354 small business owners or managers distributed across the US. 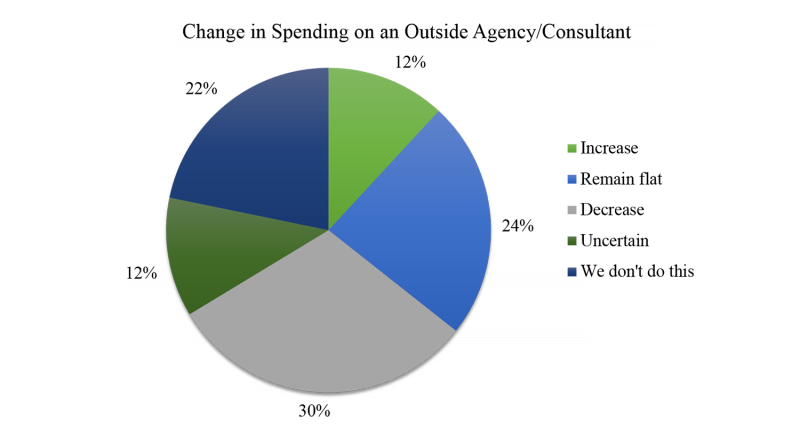 The largest respondent group is made up of companies with less than 10 employees and less than $1 million in revenue. The majority of companies surveyed predict relatively flat revenue growth in 2015. For more information or to provide feedback on our survey, please contact [email protected]. Read detailed client reviews of traditional marketing and advertising agencies. 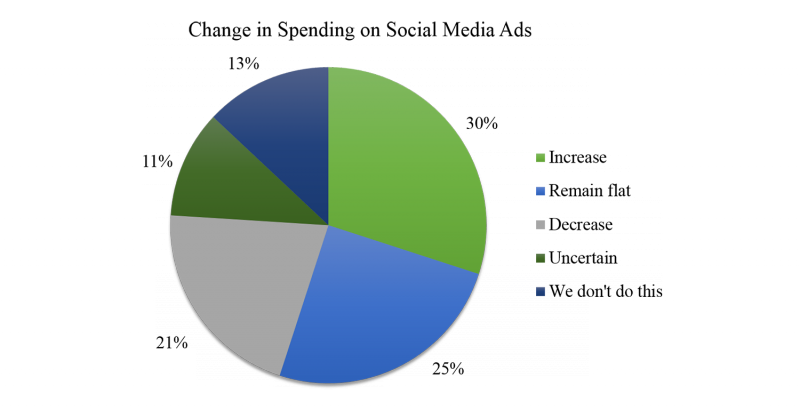 See how your marketing habits compare to 500 other businesses' marketing priorities.